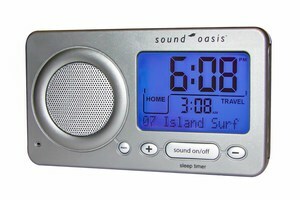 Travel Sound oasis - includes much the same as the larger Sleep Sound Therapy System. Includes 12 sleep / relax / wellness sounds (Ocean Surf, Rain, Stream, White Noise, Woodlands, Thunderstorm, Energy Chimes, Tranquillity, Alpha Clouds, Sleep Surf, Delta Voyage and Dream Echoes. Includes bonus 12 tracks (Spa Retreat Card - Hawaiian Surf,Gentle Rain, Waterfall, Island Stream, Asian Garden, Summer Night, Unwind, Reflection, Serenity, Easy Days, Late Night and Stillness.